The rivalry continues as Quincy beat the Tigers on Feb. 1 in Portola by a score of 84-75; a flip from a game with PHS just a week earlier when the Tigers won 56-53. The loss Jan. 23 to PHS is the only loss on the Trojan league record, 6-1. Cameron Dingel has been leading scoring for the Trojans followed by a strong QHS team of shooters: Sein Yoachim, Noah Hardee, Miguel Williams, Luis Santos, Quinn Holzer and Brady Peay. 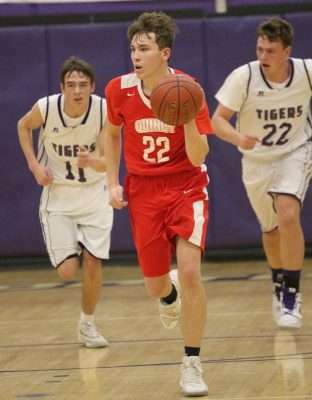 Scoring for the Tigers was Keegan Folchi with 23 points, including five 3-pointers and four for four free throws. Dylan Gonsalves added 15 and Owen Bowling scored 9 points including three of four free throws. Three Tigers scored 8 points: Mario Ruiz, JT Massey and Ricky Johnston. PHS Cody Callahan and James Sampson scored 2. Owen Bowling was a clean up man for the PHS Tigers picking up 17 rebounds! The Trojans have two home games to finish off the regular season before playoffs begin, perhaps as early as Feb. 12. The two home games are today, Feb. 6, at 6:30 p.m., facing the Maxwell Panthers, and Friday, Feb. 8, same time, against the CORE Butte Lynx. The two games match Quincy against the complete opposite ends of league opponents. Quincy is tied in first place with Maxwell and represents the only loss on the Panther league record. The last time the teams met, Jan. 9, Quincy won 82-70. The Trojans won Feb. 2 as they took on the Mercy Warriors in a battle that ended 44-40. Lexi Baumgartner led the QHS team with 25 points. Emmary Wingfield scored 9, CoraGrace Hardee sunk 5 points, Elaina Warndorf, 3, and Annie Froggatt added 2. The girls’ games against Maxwell and CORE Butte, on the same dates as the boys, will start at 5 p.m.